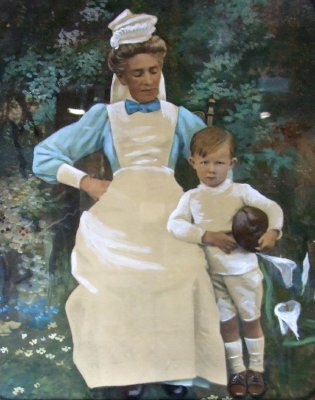 Description Nurse Mrs. Jellyman and Kenneth Arthur (Marsh) Loveday. Information given by Mrs. C. Coleman, Stoke, Nelson. Portrait rescued from Picton rubbish dump. Part of the Picton Hospital Medical display.